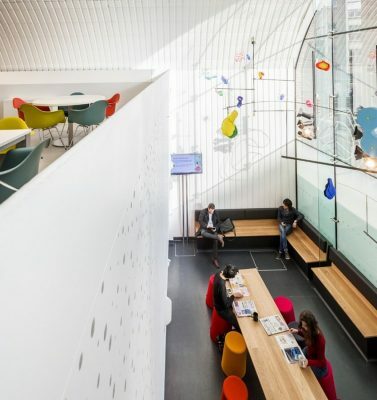 Urban Salon’s first project for the NHS, the Burrell Street Sexual Health Centre came out of a design competition that engaged designers & architects from outside the healthcare specialism. 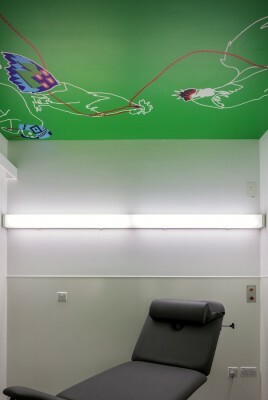 Their brief was to transform two railway arches in Burrell Street, Southwark and create a welcoming clinic, which had a look and feel that was very different from the standardized hospital environment to help break down taboos around the nature of the clinic. The spaces at the front of both arches are used for registering and waiting for appointments. The waiting room is welcoming and informal and features a communal table for visitors to read newspapers and drink complimentary coffee. Located next to the full height glazing to the street, the waiting area incorporates graphics that strike the balance between allowing views into reception from the exterior and protecting visitors’ privacy as they sit in the waiting room. Circulation in each arch is arranged around the central pier that supports the two arches, creating a central circulation loop that is double height to maximize natural daylight and create a generous space. The consultation rooms are located off this space and the doors to the consultation rooms are finished in blackboard laminate that is used by clinical staff to write their names on in chalk when in use. To put visitors at ease, the consultation rooms are divided into two separate areas – a warm and conversational space at the front to encourage discussion that can be screened off from the clean and fresh clinical section at the rear that is used for examination. In addition to the consultation rooms, there are two rooms used by health advisors for counselling. Located away from the busier parts of the clinic, these rooms have sofas, lower light levels and Eames Elephants chairs for when children are present with their parents. Throughout the clinic, Urban Salon commissioned art to create a positive and welcoming atmosphere that puts users at ease. In the waiting room, the artist, Arnold Goron created two suspended mobiles comprising forms that are reminiscent of sexual organs. The pieces gently rotate and are visible from the street. 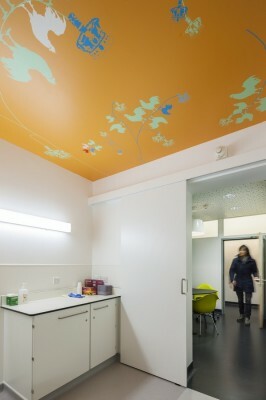 Each of the sixteen consultation rooms feature brightly coloured ceiling art developed by artist/designer, Allison Dring. These artworks cover the entire ceiling and take sexual puns and imagery as their theme. The ceiling art is designed to be read from the examination couch and to slowly reveal themselves to the viewer. Graphics designed by Martin McGrath that references the ceiling art and provides a friendly tone of voice is used for way-finding signage. A 120 seat auditorium has been created on the first floor for use for teaching, internal meetings and to hire out to outside organisations. The ceiling of the auditorium is curved to fit the curve of the arch.